A first date may end with a kiss. It's the end of your first date and, as you stand at her front door, you are searching for the right sweet thing to say. If the date went well, you want to let her know you enjoyed yourself -- without coming on too strong. Getting a second date might be a goal too. Let her know how you feel the night went -- and that you had a good time. Say something like, "I had a wonderful time tonight" or "I felt we had a really good connection." Showing that you are interested makes you more attractive to a potential partner, notes psychology professor Paul Eastwick, as cited in the "Men's Health" article "Make a First Impression That Leaves Her Wanting More." She may respond in kind and let you know that she enjoyed the evening as well. Give her a compliment that shows your interest in something unique about her, says psychology professor Shanghong Luo. For example, you might say "You have the most beautiful eyes" or "I really like your gentle nature." Although a girl will be entranced if you show interest, she will be even keener to see you again if she feels that there is something special or unique about her that has drawn you in -- and that sets her apart from other girls you have dated. Girls get nervous about how they are doing in the romantic chemistry department as much as guys do -- meaning, she wants to know that you are attracted to her, says psychologist Sheenah Hankin, as cited in the "Cosmopolitan" article "Compliments She'll Love." Say something like, "I am really attracted to you" or "Your lips are so soft" after a kiss. Show her that you enjoyed getting physically close or that you want to in the future if it hasn't happened yet. You might be thinking about seeing her again. Make your interest obvious by saying, "I don't want this night to end" or "I would really like to see you again." If she is interested, she will be excited to make plans for a second date and happy to know that the feeling is mutual. If you don't get the response you are hoping for, know that not all first dates work out. At least you were honest about your feelings and gave it your best attempt. 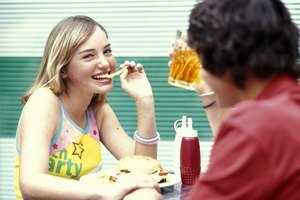 It's better to be yourself and be disliked than to put up a false front that you must keep up in the future, says Dr. Fredric Neuman in the Psychology Today article "Making a Good Impression on a First Date." Cuncic, Arlin. "Sweet Things to Say to a Girl After a First Date." Synonym, https://classroom.synonym.com/sweet-things-say-girl-after-first-date-22843.html. Accessed 20 April 2019.